Army Staff Sgt. Jonathan Meadows and Jackie Biggs discuss a painting during an art therapy session at Fort Belvoir Community Hospital's traumatic brain injury clinic at Fort Belvoir, Va., Dec. 19, 2014. Meadows, assigned to Fort Belvoir's Warrior Transition Battalion, suffered a traumatic brain injury in 2012 when his vehicle rode over an improvised explosive device in Afghanistan. 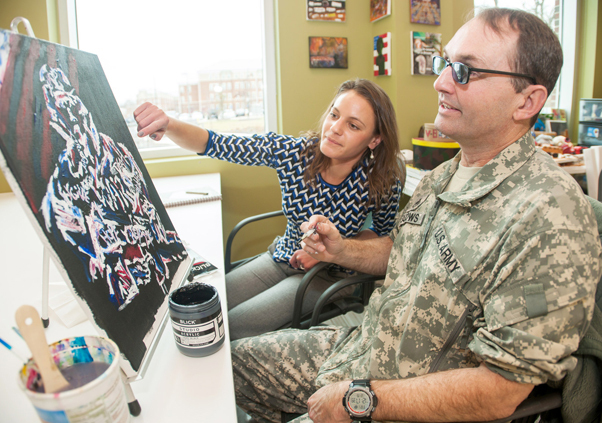 Biggs is an art therapist, and manages the program for Wounded Warriors in the TBI clinic. WASHINGTON — Service members who take part in art therapy to soothe the symptoms of war’s invisible wounds display acts of courage and resilience to put them in control of their lives, the assistant secretary of defense for health affairs said today. Speaking at the 2015 Wounded Warrior Healing Arts Recognition “Show of Strength” event at the Pentagon, Dr. Jonathan Woodson said service members, professionals, families and other caregivers have critical roles by supporting art therapy and ensuring its success. Woodson said a wide variety of wounded service members’ “museum quality” art on display at the event caught his eye. “I was reminded of the infinite potential of art to assess the human emotion, access the human emotion, and exploring … to understand emotions are complex issues,” the assistant secretary said. “Today is a celebration of recovery and rehabilitation,” he said, noting that the celebration includes the expanding partnership of the Military Healing Arts partnership between the Defense Department and the National Endowment for the Arts as part of the Warrior Care Month observance. Nine service members whose artwork was displayed received certificates of recognition for artistic achievement. Healing-arts therapy was a key part of their recovery and rehabilitation, explained James Rodriguez, deputy assistant secretary of defense for warrior care and policy. 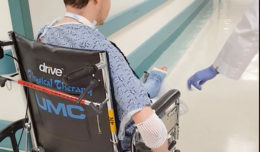 Acknowledging that healing arts might not benefit every service member, because each case is individual, Woodson said the option to enter the program should be included for all as an option to expand their therapy plan. And there are many reasons why the DoD-NEW partnership is important, he noted. Studies show creating art can produce calming effects on invisible wounds, because art therapy can decrease stress hormones, which can relax and lessen anxiety – especially for those used to staying hypervigilant in high-stress environments, Woodson said. Creating art to express feelings and help them externalize what they might have repressed for a long time can help return service members to a normal existence, he added. 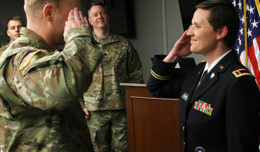 Because of what they’ve experienced, service members often deal with a complex set of feelings and emotions that make it difficult to relate to people, Woodson said. The invisible wounds can lead to feelings of shame, guilt and identity crises that might cause them to retreat and engage in isolating behaviors,” he added. “Art therapy is a lifeline out of that isolation,” the assistant secretary said.